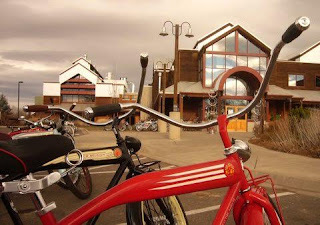 Ft. Collins, Colo., – February 18, 2016 – Bicycle advocacy has been part of New Belgium Brewing’s core from day one and as the brewery prepares to celebrate its 25th anniversary, the League of American Bicyclists has once again recognized New Belgium as a platinum-level Bicycle Friendly Business (BFBSM). Platinum is the highest honor awarded. With the announcement of 73 new and renewing Bike Friendly Businesses, New Belgium joins a forward-thinking group of 1,132 businesses, government agencies and Fortune 500 companies in 49 states and Washington, D.C., that are transforming the American workplace. Bicycle Friendly Businesses are corporations, organizations, nonprofits and associations that weave bicycling into their business culture and give employees and customers the opportunity to be active stewards of their personal and environmental health through bicycling. When bicycling is infused in an office or company culture, great things happen: reduced health care costs; more productive employees; improved worker and customer satisfaction; smaller carbon footprint; and increased corporate social responsibility. The Bicycle Friendly CommunitySM, Bicycle Friendly StateSM, Bicycle Friendly Business and Bicycle Friendly UniversitySM programs are generously supported by program partner Trek Bicycle Corp and Silver-level BFA Sponsor Planet Bike. To learn more about building a Bicycle Friendly America, visit www.bikeleague.org/BFA.